With today’s record energy costs, there’s never been a better time to invest in a Pentair Aquatic Eco-Systems XLHP High Performance Heat/Cool pump. With today’s record energy costs, there’s never been a better time to invest in a Pentair Aquatic Eco-Systems XLHP High Performance Heat/Cool pump. Compared to gas, oil or electric heaters, XLHP High Performance Heat/Cool Pumps use just a fraction of the energy to generate the same amount of heat. In fact, just 20¢ worth of electricity produces $1.00 worth of heat generated by other methods. Lifetime Warranty- Titanium Heat Exchanger. 10-yr Warranty-Compressor Parts/Labor. 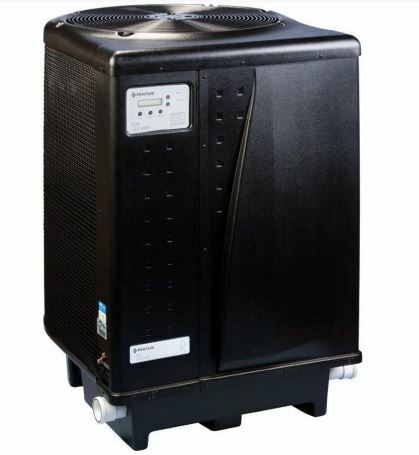 Both models are capable of heating and/or cooling the water. Full heat/cool functionality. 2-inch unions included for easy installation. AutoSet Temperature Control monitors water temperature and turns the pump on/off as needed. Features the legendary Emerson® Copeland Scroll® Compressor that’s more efficient, durable, reliable and quieter than any piston-driven compressor. EPA-recognized, environmentally safe, non-ozone depleting R-410A refrigerant. LCD control board displays an intuitive, menu-driven readout with easy to follow, full word messages—no codes to memorize. Automatic defrost feature senses refrigerant temperature and helps prevent the XLHP heat pump from freezing, allowing the unit to operate effectively at even lower temperatures than many competing products. ETL listing is your assurance of safer, dependable operation. independently tested to certify that manufacturers’ performance claims are accurate. Port Size: 2″ ; unions included with model 460900-AQ. If the system flow rate exceeds 120 gpm, a bypass valve is required. COP is Coefficient of Performance.